"The Gear Works" includes all the basic amenities and sundries detailed below that you will need for your white water adventure! Please make your selections from the drop down lists you see. It's IMPORTANT TO NOTE that any item returned for a refund or credit from "The Gear Works" Package will necessitate that you be charged full price for all kept items. Thank you for understanding. Microfibre Towel & CampSuds Camp Set - This set comes with a large ultra-light patented microfiber that instantly soaks up water on contact and a 4 oz. bottle of CampSuds, a bio-degradable all-purpose soap that is gentle on skin, hair, and clothing. Aurora Headlamp - THIS IS A NECESSITY IN CAMP! Especially useful when you're eating around the campfire at night, under the stars and moonlight, you have to be able to illuminate your food and eat at the same time. You need two hands to eat and the headlamp is the perfect answer for this and other nighttime maneuvers. Bug, Sun, & Lip Kit - A Great "Three in One" combination: Ultrathon Insect Repellant by 3M with 33% DEET formula + a 3 oz tube of All Terrain "AquaSport" SPF 30 waterproof sunscreen with "Z-Cote" + All Terrain SPF 25 Lip Balm. Camp Comfort Kit - An Eagle Creek classic - you get a "2 in 1" Travel Pillow & a Cat Nap Blanket.Ideal for use in camp and on planes, you can use this set in any number of combinations. Use the pillow "2 ways" - as a "U-shaped" contour around your neck (11" x 13.5") while in flight or transform it into a rectangular shape (10" x 13") for use in camp! The blanket - well you can use it 3 ways! It's a full coverage blanket (59" x 36") complete with "foot pockets" and a zip storage pocket for use in flight. In camp - use it as an extra blanket, campfire throw or pack it into its own pocket where it, too, can double as a pillow (11" x 10") in a pinch. CHUMS Classic Eyeglass Retainer - Perfect for those who prefer a low profile eyeglass retainer without a tail. Fits standard frames and slides up frames for a snug fit. Nalgene 32 oz. Widemouth Loop Top Bottle & Mini-Clip Caribiner - BPA-free and widemouth, this is Nalgene's most popular bottle. Durable caps create a leakproof system, screws off easily, and never gets lost. Comes with a fair size clip caribiner that easily clips to your pack or the boat. Waterproof Mini Whanganui Sack - The Mini Whanganui is perfect for Smartphones. It thrives in a water environment - the case / sack is waterproof, dustproof, and submersible up to 15ft. Waterproof River Guide Book -This handy, waterproof river guide is a "must have". 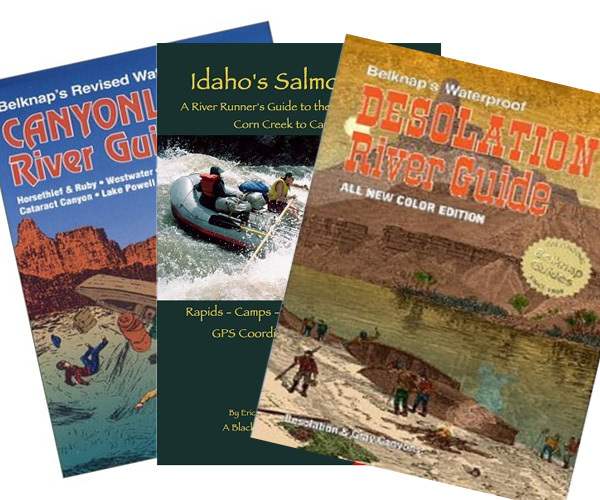 Each guide offers mile-by-mile river details including rapids, campsites, geology, history of the region and the river, and more. Clip Carabiner - Great for quickly attaching keys, sandals, dry bags, or other valuables to anything secure.